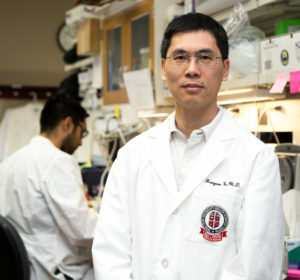 Haoquan Wu, Ph.D., associate professor in the Graduate School of Biomedical Sciences (GSBS), has received a two-year, $420,000 grant from the National Institute of Allergy and Infectious Disease (NIAID) to study Enterovirus 71 (EV71). EV71 is a relatively new virus that has been compared to polio. EV71 is considered the second-most important enterovirus after polio because of its similar ability to cause paralysis in young children. In recent years, several severe outbreaks of the virus have been reported worldwide, particularly in the Asia-Pacific region. In 2012, the virus killed more than 60 children in Cambodia and less than a year later, caused neurological complications in about 30 children in Australia. With the NIAID grant, Wu and colleagues will try to determine which human genes enable the virus to attack and kill human cells. To do this, Wu will conduct a genome-wide knockout screening — specifically knocking out, or deactivating, each gene in the human genome — using the process of elimination to identify the genes involved.